Toledo and Co. offers our customers superior quality locks made by strict specifications to ensure an outstanding security. Toledo Fine Locks is a combination of the latest technology and a traditional craftsmanship with a lifetime warranty. For added security, the entry lock set features an Anti-Bump System. Toledo Fine Locks is perfect for designers and homeowners looking for an alternative that provides distinguished quality, high security, beautiful designs and fine finishes. The electronic lock is the new way to secure your home. 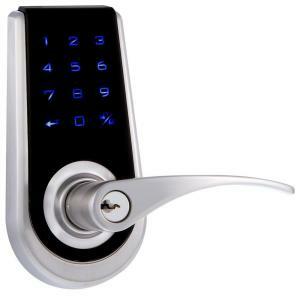 The electronic lock is the new way to secure your home. It gives you a convenient and practical way to access your home: with a key or code number. Make an upgrade to your home security with this magnificent electronic lock and feel secure day and night, when you are in or when you are out. Tbook.com crawls the web to find the best prices and availability on Locks and related Tools and Hardware products like Toledo Fine Locks Bilbao Single Cylinder Stainless Steel Touch Screen Door Lock. For this page, related items include products we find that match the following keywords: "Lock" at our vendor partner Home Depot. Toledo Fine Locks Bilbao Single Cylinder Stainless Steel Touch Screen Door Lock is one of 147 Locks and related products listed in the Tools and Hardware section of Tbook.com If you have any questions on this product, please give us a call at 734-971-1210 during the hours of 9am - 5pm EST for assistance. Thank you for shopping at Tbook.com, the Internet Department Store!